Bandi: simple vest buttoning up the front, worn by men and boys in many regions of India, Pakistan, Nepal and Bangladesh. Usually worn over a kurt. Bicchiya: silver toe-rings worn by Hindu women on their middle toes, to signify that they are married. Generally, two simple bands are put on each toe, but some may have tiny silver bells on them. Bindi: The ornamental dot worn on the forehead by most Hindu women. Although it originally had religious significance and was associated with married women, the bindi now is worn by both girls and adult women as a cosmetic adornment. 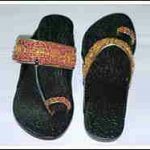 Chapal: Leather sandals worn by people all over South Asia. Choli: the short-sleeved (or sleeveless) blouse which is worn with the sari. It is often cut short leaving the midriff bare for comfort in hot weather. Chooridar: the tight-fitting pants, worn in North India and Pakistan. They are worn by both men and women, girls and boys, to accompany various types of long loose blouses and shirts. Chuba: a long wrap-around jumper worn by Tibetan women. Married women also wear over the chuba a beautifully woven apron. 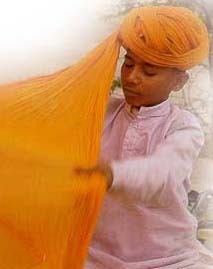 Chunni: a long light-weight scarf which is worn often with Pakistani or North Indian women’s outfits such as chooridar and kurta, or salvar and kameez. The scarf is usually draped loosely across the bodice with the ends falling over the shoulders to the back, or it may at times be used to cover the head. Dhoti: 5 yards of light-weight cotton or silk. Usually white or cream colored, which is worn by North Indian men. It is wrapped around the waist and through the legs to create pants. One end is also pleated at the front, like a woman’s sari, and tucked in at the waist. Kameez: a shirt, also a long flowing tunic-like blouse worn by women along with salvar pants. Kurta: a pullover loose shirt with a stand-up collar and two or three buttons at the front. It usually comes almost down to the knees, and has slits at the sides. 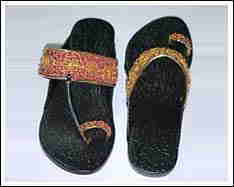 Commonly worn in Bangladesh, India, Pakistan and Nepal by men. In North India, young girls also now wear them with chooridar or salvar pants. Pagri: A turban, worn especially by men of the Sikh religion, and by others in regions of North and West India, Pakistan and Afghanistan. Payal: silver ankle bracelets which often have tiny silver bells attached, which then jingle when one walks. they are worn especially by new brides, young girls, and babies learning to walk (so that their parents can hear where they are going). Pallu: The ornately decorated end of a sari which is usually left hanging freely over the left shoulder, worn over the head, or tucked at the waist, depending on how the sari is wrapped. Sari: 6 yards of material wrapped to form a dress for women of all South Asian nations (except Afghanistan). 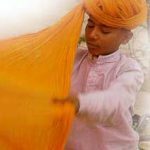 There are numerous ways to wrap the sari depending on the custom of each geographical region or caste community. The most common style includes pleats at the front for ease in movement, and the pallu, decorated end, flowing over the left shoulder. It is worn with a short choli blouse and a draw-string slip (saya) into which it is securely tucked. Saya: a long petticoat gathered at the waist with a drawstring. This is an absolute necessity when wearing a sari, in that the sari material and pleats are tucked into it to hold on the sari. Veshti: 2,5 yards of white cotton or silk wrapped around the waist to form a sarong, worn as traditionally is accompanied by a neatly folded white cloth draped over one shoulder or around the neck. Feedback, questions or accessibility issues: info@southasia.wisc.edu.